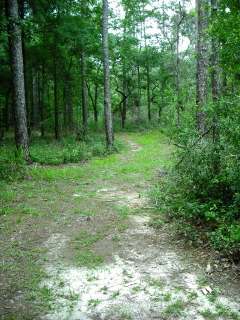 San Felasco Hammock Nature Preserve is located northwest of Gainesville in Alachua County. The park includes approximately 7,000 acres of diverse biological communities such as hydric hammock, upland pines, sandhills, and swamps. Wildlife is plentiful within the park boundaries and includes whitetail deer, armadillos, squirrels, rabbits, hawks, owls, bobwhite quail, songbirds, snakes, lizards and more! On a rare occasion, bobcat, fox, and coyote may be observed. 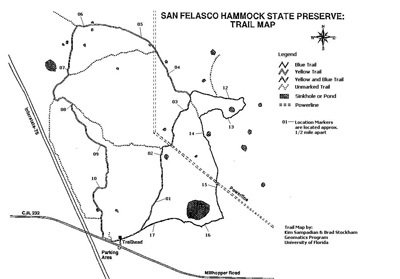 There are two main entrances to San Felasco Hammock Nature Preserve, one for hiking and trail running on the south side of the park and another for mountain biking and equestrians on the north side. The hiking trails can be accessed from the parking area located on Millhopper Road approximately four miles west of Gainesville. Facilities at the trailhead include a porta-john and sheltered picnic table. 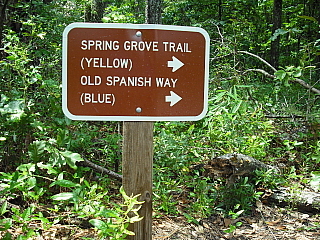 There are two trail systems located across Millhopper Road (on the north side): the blue trail and the yellow trail. The blue trail is approximately 4.8 miles in length and consists of shady, flat, non-technical trails. In contrast, the 5.8 mile long yellow trail includes some elevation change in the form of hills as well as some sunny areas. These two trails can be combined for longer distance trail runs. The mountain biking and equestrian trails are located north of Gainesville along Highway 441. This trailhead is difficult to find as it is located behind a corporate office park (Progress Park), however there is a brown park sign on the highway to assist in your search. There are approximately 30 miles of hardpack singletrack mountain bike trails that are continuously being expanded. These trails make for fun runs with lots of roots and fallen trees along with hilly and twisty terrain. On the other hand, equestrian trails are less well suited for trail runners due to the deep sugar sand that is constantly being churned by horses' hooves. 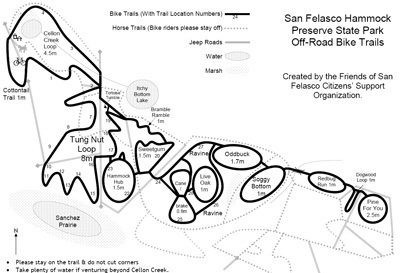 Please visit the Friends of San Felasco (Citizens Support Organization) for detailed information on these trails and to become involved in trail building and maintenance. Be sure to carry a hydration pack or at the very least a hand-held water bottle! It is hot and humid on these trails during the summer months - so be sure to stay well hydrated. Also, during the summer months mosquitos (mozzies!) and ticks are quite thick so take the proper precautions. While running on all trails, be considerate to other users (hikers, mountain bikers, and equestrians). To the hiking trailhead: Take CR 232/Millhopper Road and drive approximately four miles west of Gainesville. For further information, visit the Official State Parks web site or call 386-462-7905.